Whether purchasing a used or new truck, most of the vehicle shoppers want to get the lowest price and cheapest loan on their vehicle. So, when you start planning on getting a truck loan, you may feel overwhelmed to find the desired vehicle at best loan rates. As, it is possible only if you have proper knowledge about the loan rates, because without this, you may wind up paying thousands of dollars more than you need. Before taking any loan, you need to consider few points, that will ensure you get the best loan for your new or used vehicle. Follow some essential steps to get the truck or other heavy equipment loan in your budget. Check the credit: When it comes to get a loan, credit score plays an important role. For instance, higher credit score gives you an opportunity to save you dollars on interest and help you get a low truck loan rate. So, make sure keep your credit scores are accurate. Pick the payment: Figure out, how much you can spend each month for a truck payment without straining your budget. Once you get that amount, you can plug it into a truck loan calculator to find out the aggregate you can spend. Long term loans mean lower monthly payments. Get a pre-approval: You can also check online to know what kind of loan and amount, companies offer. If you find the best deal, you can get financing through online also. After financing, you’ll get a pre-approval, where your credit history and everything will be checked, if you’ll qualify then you will get a certain amount of money. 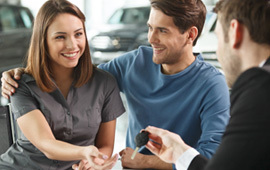 Choose the Vehicle: After getting the pre-approval, you can put your efforts to get the best deal for the truck or any other vehicle that you want. If a dealer tries to offer you a longer period of loan, then don’t accept it, as this type of deal may reduce your monthly payment but will cost you higher in the long run. If you are planning to buy a used vehicle, then don’t buy vehicles older than five years and make sure you comprehend the restrictions on used truck loans. Finalize the Paper: After choosing the vehicle, the financial department of the dealer will coordinate with the lender to finalize the deal and they will try to get you to buy add-ons, such as VIN etching, paint or fabric protection etc. So, think carefully and don’t take any decision under pressure. Now you are more informed with the basics of financing a vehicle. So all the best and get the loan for your used or new vehicle, as per the budget. We, at Canada Equipment Loan, help the Canadians to avail the loans at attractive rates of interest and low processing charges for business or personal use. So, contact us today, and get the best loan rate on your desired vehicle in a short period without any hassles.